Tarikh tutup 11 Jun 2013. Participants will be entitled to only one prize ( the higher prize in the category). Prizes subject to confirmation . Certificates shall be given to All Players. Or to Azri Hohad (012-7953806) at UTM. Pendaftaran penyertaan adalah pada pukul 8:30 pagi – 9:00 pagi pada hari pertandingan. Bagi peserta yang datang dari luar UTM, sila ikut arahan penunjuk arah berwarna putih yang digantung pada tiang lampu/banting dari pintu masuk utama UTM. 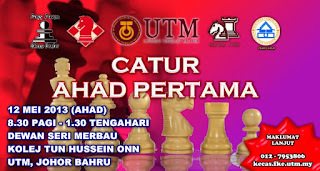 This year National Closed will be held at UMT, Kuala Terengganu from 27th May (Arrival) to 2nd June (Departure). All participants must arrive on 27th May to attend the Players meeting, else your name will not be paired for Round 1 which is scheduled on 28th May. This year top finishers from National Closed have chance to play in Malaysian Masters and also be included into the National Squad automatically. Click here for more information on how to qualify into Malaysian Masters. Please take note that with effect from March 2013, player's registration for all National-level chess tournament must go through respective State-level Chess Association. No more direct application to the Tournament Organiser or MCF. 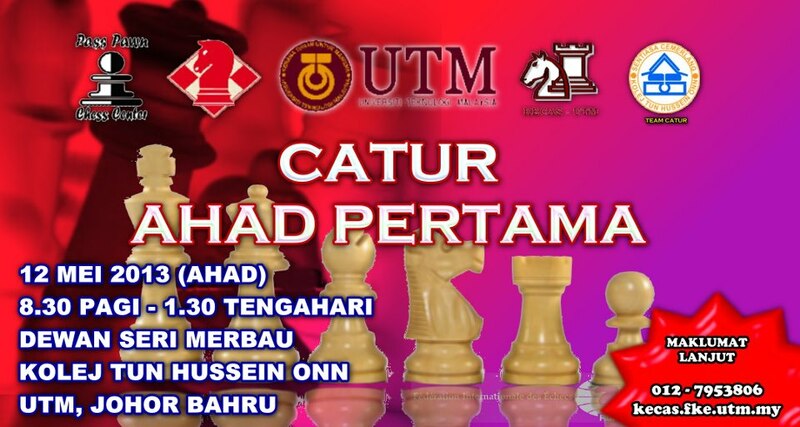 Any Chess Players from Johor can write-in to Johorchess@gmail.com for enquiries, while players from other states can check with their respective State Association Secretary on the National-level Tournament Entry Form and the Players Registration Form. Qualified player must fill up JohorPlayers Registration Form and submit the form via email to johorchess@gmail.com by 15th MAY 2013. All registration fees shall be paid by JCA. All expenses on travelling and hotel accommodation fees shall be paid by player. Anyone who is eligible under MCF-invited Namelist (please refer to NCC 2013 Application form) must fill up 2 forms i.e. 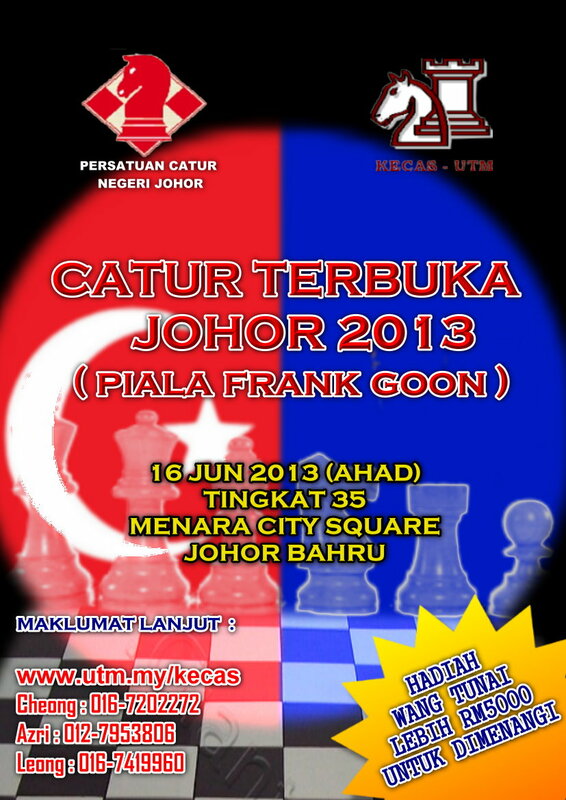 Form B of NCC 2013 and JohorPlayers Registration Form and submit both forms via email to johorchess@gmail.com by 15th MAY 2013. All expenses on travelling and hotel accommodation fees shall be paid by player. Meanwhile, anyone who wish to apply for a place as Johor Additional Player must fill up 2 forms i.e. Form C of NCC 2013 and JohorPlayers Registration Form and submit both forms together with bank-in slip [Bank-in RM 150 into Maybank account 001271103730 (Persatuan Catur Negeri Johor)] via email to Johorchess@gmail.com by 15th MAY 2013. All expenses on travelling and hotel accommodation fees shall be paid by player. Women Qualification : A minimum rating level of either National Rating 1400 (April 2013 release) OR FIDE 1550 (May 2013 release). Click here to download NCC 2013 Application form. Click here to download JohorPlayers Registration Form.